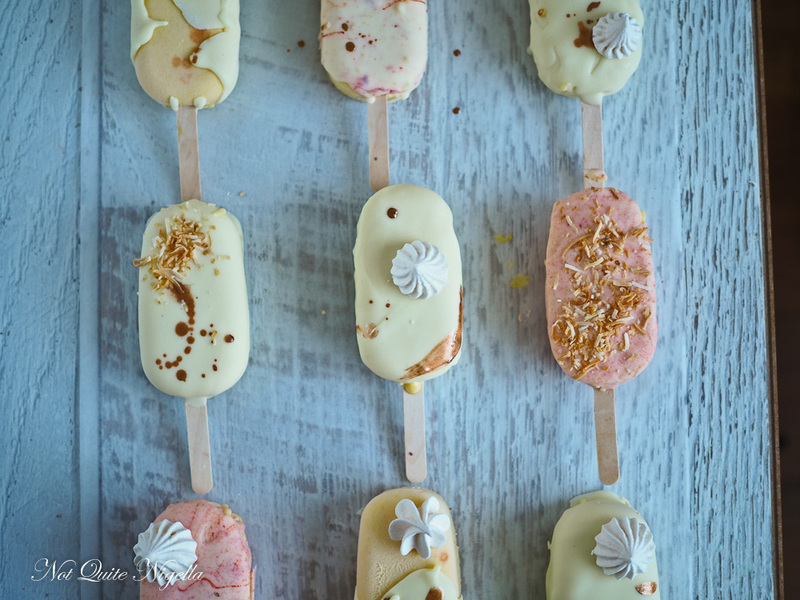 Pop Art: Mango & Toasted Coconut White Chocolate Popsicles! 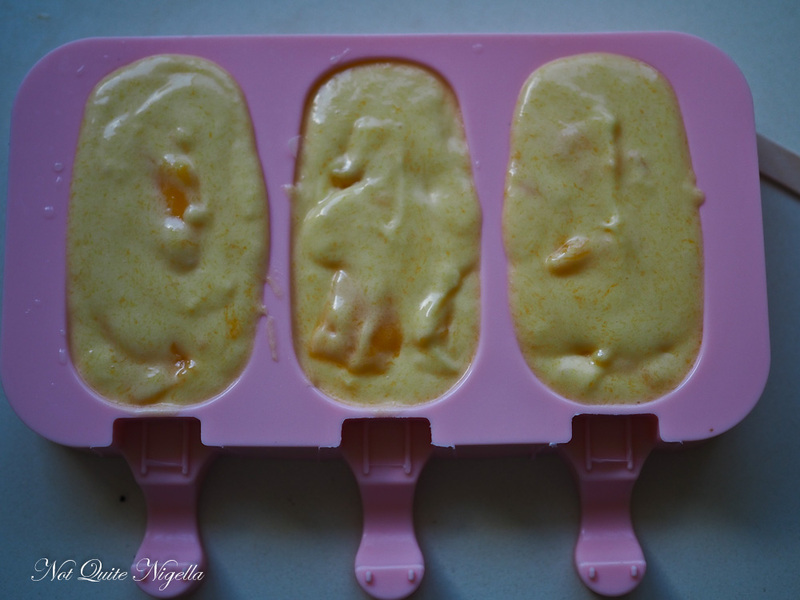 Have you ever tried making your own popsicles? It's really easy once you have a mold and you can design your own to your heart's content! 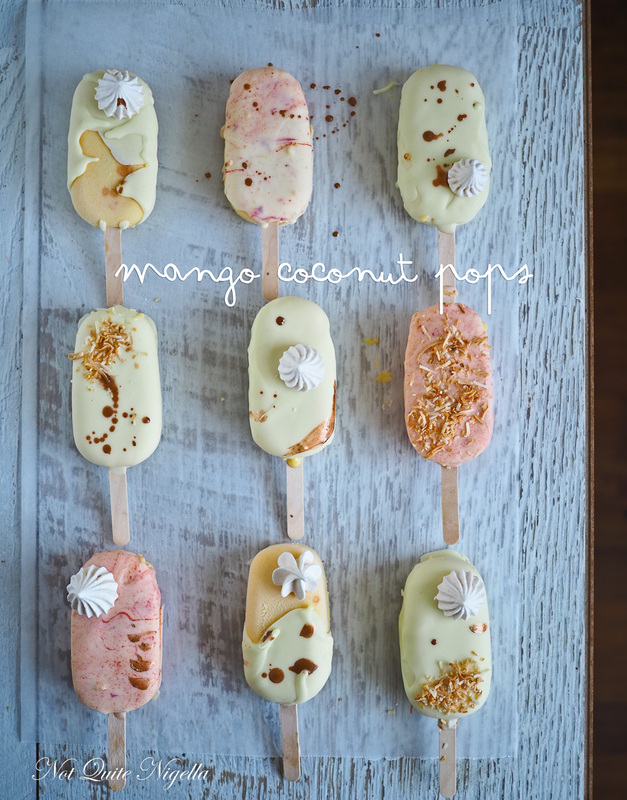 We tried a summery combination of mango, white chocolate and coconut! Easy as 1, 2, 3! I was inspired to make these by an ad for a popsicle that we saw while driving one day. It caught ice cream freak Mr NQN's eye and he started drooling at the idea of mango and coconut. We have a system, he gets the ice cream bit, I get the chocolate (I'm not such a big ice cream eater but chocolate is another story) but this time he wanted his own. We stopped to buy one. It wasn't bad but it didn't have enough mango in it. I promised that I would try my hand at making my own when mangoes were in season. Then suddenly as happens every summer, rosy cheeked mangoes filled the markets with their unmistakable aroma. 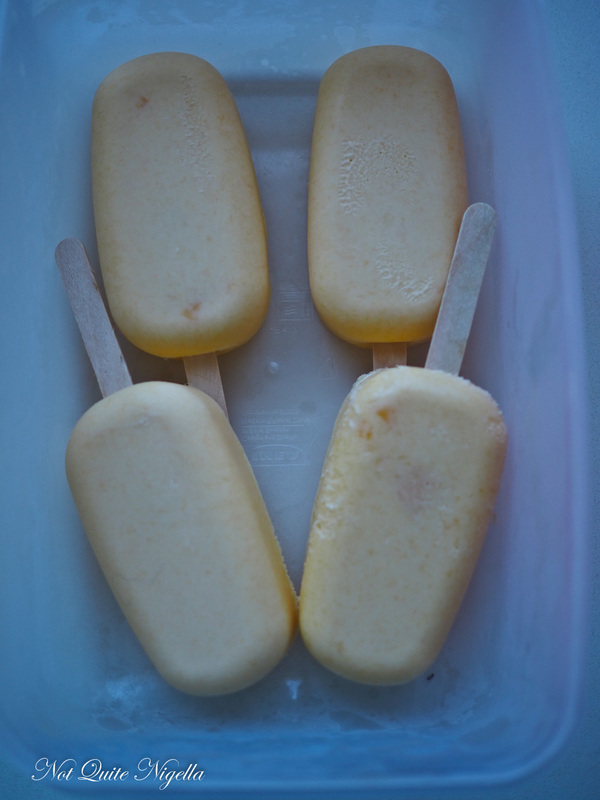 I made the ice cream with a lot of mangoes and cream and then coated them in white chocolate. It was all much easier than I thought it would be as I had a mold. 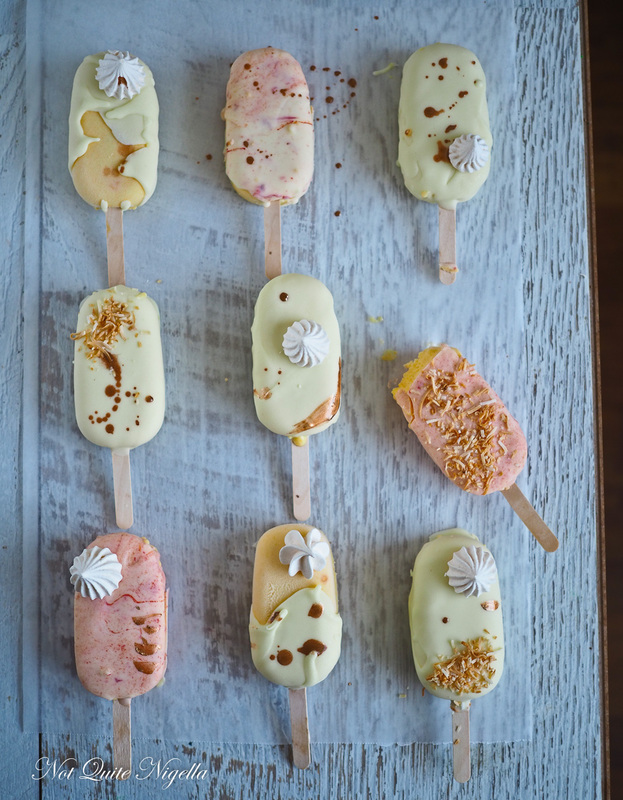 Before the day was over, I had 9 popsicles made exactly how we wanted them-bursting with mangoes and cream and the best Belgian white chocolate and toasted coconut. I even decorated a few with drips, reverse drips, meringues and copper tinted splashes. Mr NQN devoured them happily declaring them his favourite popsicle. The day before he had gone on a long bike trip to Newcastle which left me to go out to dinner with friends. For the ride they were meeting at 9pm and would ride all night. He would then take the train back to Sydney the next day. "Where do they sleep?" asked Queen Viv. "They probably lie all on top of each other in a pile," replied Belinda. "They have all that sweaty lycra to keep them warm. They might throw a horse blanket on them," I mused. The truth was that they didn't sleep at all that night. They cycled until 4-5am and then got on the early train back to Sydney afraid to fall asleep on the train in case someone stole their bikes. Mr NQN came home on Sunday morning at around 8:30am but I was still asleep. "Why didn't you come in and wake me?" I asked him when I woke up half an hour later. "I was scared you had booby trapped the bedroom door," he replied. He knows that I live in fear of being attacked while asleep. He was right, I sure as hell did booby trap the bedroom! I watch too much true crime to not. If anything I want my gravestone to at least say, "Hard to kill" ;) Oh and "She loved to cook." So tell me Dear Reader, are you scared of sleeping alone? What would your gravestone say? And do you make your own popsicles? 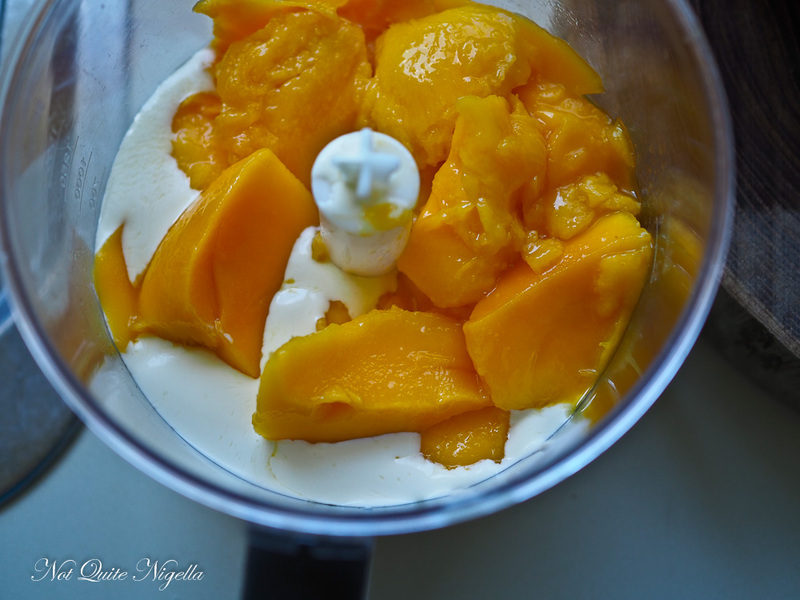 Step 1 - Blend the mango, sugar, nectar, cream and vanilla together in a food processor. Pour into ice cream molds and place sticks in place. Freeze until solid. Remove from the molds and keep in the freezer until needed. Step 2 - Have a parchment lined tray ready for the ice creams. Melt the chocolate with the coconut oil until liquid and smooth. Pour the chocolate over the ice cream and if you are adding meringues or toasted coconut add these straight away before it sets (it sets very quickly). I left it til there were three left and then I added a little orange food colouring and swirled it through the white chocolate and the poured it over the ice creams. Keep in the freezer (but I'm sure that you knew that). recipeThe Incredibly Moreish Peppermint Crisp Fridge Tarts! recipe The Incredibly Moreish Peppermint Crisp Fridge Tarts!